Our new state of the art City Library opened its doors for the first time on Sunday 7 June 2009 at 11am. Opening this wonderful new library on a Sunday was a symbolic statement, and one which emphasises Newcastle City Council’s commitment to providing contemporary and easily accessible services. 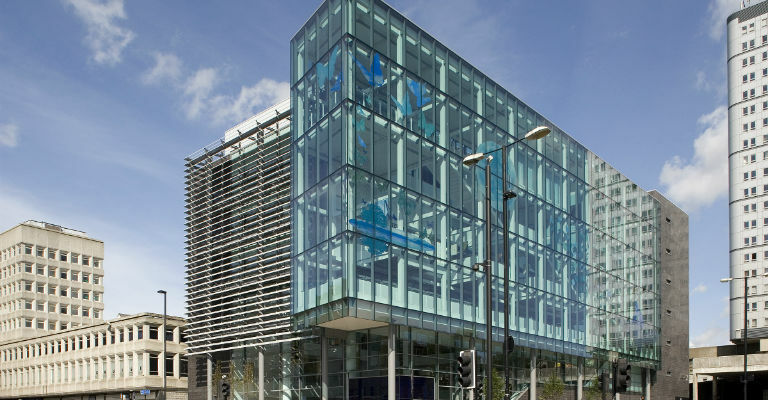 The new main entrance into the building is through a dramatic blue glass box on New Bridge Street West with a second entrance on Princess Square. Level 1 has a stunning range of new non-fiction titles as well as an integrated reference library. The whole building will be self service with self-issue and return facilities. This means that instead of being stationed behind a desk our staff can help you more easily. On the Princess Square level we have a superb cafe (with additional outdoor seating on the redeveloped Princess Square), express email facilities, meeting rooms and the Bewick Hall – a performance space that can seat up to 185 people. There are also superb display and exhibition facilities. Level 3 includes a wonderful new children’s library as well as adult fiction and community languages. It also has a music and audio visual section for music scores, DVDs. blurays and CDs. Level 4 is the main floor for free public computer use. Over 30 computers can be booked free of charge for up to 2 hours. There are over 100 computers throughout the building, including the facility to scan documents. Level 6 provides a stunning local studies and family history service, with unique local collections, generous research and study space and the latest standard of protection (BS 5454) for Newcastle’s unique printed resources. Here you will see the Newcastle Collection – an exhibition of the very special rare books that the City Library owns. Perhaps more unusual is the 24 hour vending machine, providing a range of books and DVDs from the external 24 hours service area. The library also has a British Library ‘Turning the Pages’ digital kiosk which highlights examples from our rare books collection. Throughout the building are features such as limestone flooring, specially commissioned furniture, the latest self-service facilities, and specialist book exhibition areas. We hope you visit the new building and that you find it a building to ‘delight and inspire’.